This are my first Standard Kits Templates for FM 2019. Re-edit the collars to look sharper. Only Basics templates! More to come! PS: Please, if you create more design's, collars, add them here!!! 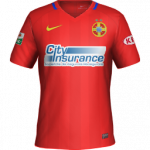 This templates, are default Standard Kits for FM 2019 and includes technical sponsor. No team are in this package, only basic templates. You will have to ad your own logos and kits sponsors, yourself.